Operable in stand-alone mode or via DMX interface. DMX512 control possible via any commercial DMX controller . 2, 5 or 6 DMX channels selectable. 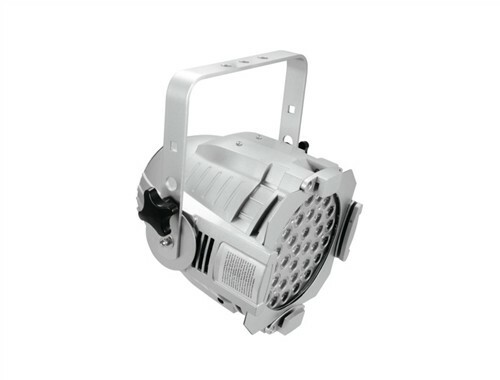 Equipped with 36 4 W BCL LEDs in warm and cold white. Functions: CW/WW color mixture, 17 preset color temperatures, dimmer, strobe effect, Master/Slave operation. Different dimmer curves and dimmer speed (step response) adjustable. Comfortable addressing and setting via Control Board with LCD display and four operating buttons. Mounting bracket for installations on a stand or a crossbeam. Locking possibility at the mounting bracket. With color filter frame. Optional barndoors available. Ideal for theatres, large stages as pre-stage spot and mobile use. Ready for connection via power cord with safety plug. Available in silver or in black.